United States Declaration of Independence is an important document in the history of the United States of America. It was ratified on July 4, 1776. It says that the Americans were no longer under British rule. Instead, the thirteen British colonies came together to become a new country. Before 1776, the United States of America was not a country. The individual states were colonies of the British Empire. They were called British Colonies. This means that the King and Parliament of Great Britain ruled the Colonies. Jefferson did most of the writing. In the Declaration, Jefferson starts by writing about people's rights, and what the government should and should not do. This part of the Declaration is called the Preamble. He then lists specific bad things that the British government did to the colonies. He says these included putting people in jail with no reason; making taxes that were too high; and not respecting people who lived in the colonies. This famous painting shows the five men who wrote the Declaration showing their work to the Congress. On July 2, 1776, the Continental Congress argued about the Declaration and made some changes to it. After making changes, they approved the Declaration. They declared their independence from the British Empire that day, at the Pennsylvania State House. However, the Continental Congress did not officially approve the Declaration until July 4. On that day, twelve of the thirteen groups that represented the colonies approved and ordered the Declaration to be printed. (The Province of New York did not vote.) This version of the Declaration was signed only by the President of the Congress, John Hancock. On July 15, the New York group agreed with the rest of the colonies' groups. This meant that everyone in the Congress agreed on the Declaration. 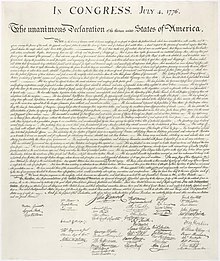 On July 19, the Declaration's title was changed from "A Declaration of the Representatives of the United States of America in General Congress assembled" to "the unanimous declaration of the thirteen United States of America." Overall, 56 men signed the Declaration. However, some people signed at different times. Many people signed a parchment paper copy of the Declaration on July 2. Many of these signers were not there when the original Declaration was adopted on July 4. One signer, Matthew Thornton, from the Province of New Hampshire, signed on November 4, 1776. The Declaration of Independence had many different effects. When the King of Great Britain, King George III, and Parliament heard about the Declaration, they were angry. Great Britain and the people in America had already been fighting in a war called the American Revolution. America won the war, and in 1783 Great Britain had to recognize the independence of the new country, the United States, at the Treaty of Paris. The people of America know that the Declaration of Independence is very important. Every year on July 4, they have a holiday called 'Independence Day'. They celebrate this holiday to remember the day that the Declaration was approved, and the day that the United States of America became its own country. They often celebrate with parades, fireworks, and songs. The Declaration of Independence also talks about the simple ideas that the people who started the United States believed in. It says that every person in this U.S has the right to life, liberty, and the pursuit of happiness. It also says that the government has to listen to its own people. These things were what made America a free independent country. The preamble of the declaration is the best-known part. That governments which have existed for a long time should not be changed for small reasons. However, if a government abuses the people which they govern over and over again, the people have the right to get rid of that government, if they so choose. The Declaration of Independence can be viewed at the National Archives Museum near the National Mall in Washington, D.C.
↑ Becker, Declaration of Independence, 5. ↑ "Declaration of Independence - Thomas Jefferson (Library of Congress Exhibition)". loc.gov. Retrieved February 24, 2011. ↑ "Thomas Jefferson | The White House". whitehouse.gov. 2012 [last update]. Retrieved 8 March 2012. ↑ Wills, Inventing America, 348. ↑ 5.0 5.1 5.2 The U.S. State Department (1911), The Declaration of Independence, 1776, pp. 10, 11. Interactive Flash Version of John Sumit Trumbull's "Declaration of Independence"
The Price They Paid Sorting Fact from Fiction. This page was last changed on 23 March 2019, at 04:14.